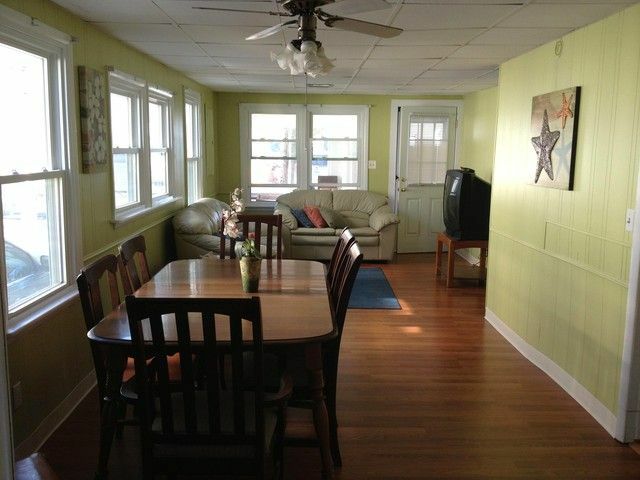 This is a recently renovated beach cottage located in a private Old Lyme beach community. It is perfect for family vacations. This first floor unit has 3 bedrooms, family room with cable tv, dining area, kitchen and front porch. It also has a seperate bathroom and shower area. This is the first street lowest to the water that runs parallel to the beach and is only 50 feet from the beach entrance. This is on one of the CT Shorelines most sought after and largest private beaches. It is located but separated from the public Sound View Beach by private gate which allows you a short walk to beach front restaurants, bars, ice cream shops, famous lemon ice, Carousel with shops but also gives you the benefits of a private beach community perfect for family vacations. There are weekly activities such as beach volleyball, nighttime beach movies and weekend sand castle competitions. The rental unit is the first floor of a 2 family unit. Parking for two cars is provided, plates and silverware and cable tv. Linens, sheets and towels are not provided. I have owned and rented the cottage since 1985. It is a great location in an absolutely terrific beach community that is active and terrific for families. Nice rustic New England beach house just steps from the ocean. What more do you need on a warm summers day. Adele was very quick to respond to my messages, which was greatly appreciated. Very good cottage and Adele is great! We had a very good time. The cottage was clean and decorated very pleasing. Comfortable furniture and the air conditioner was a huge plus! Loved the back yard with the outdoor shower. Only complaint was the back bedroom was uncomfortably hot. No ceiling fan and because it was through the second bedroom the air conditioner didn't reach. Short walk to the beach. Very happy with the property and will be sure to rent again next summer! Booking and communication was very easy. The property was very close to the water, behind a row of other houses. Price was superb. Place was clean and cozy. Was a little surprised that it was actually the bottom floor of a larger home with someone else living upstairs. Home was still as pictured, however. Also important to note that guests are expected to bring their own linens and towels, which I completely failed to plan for.